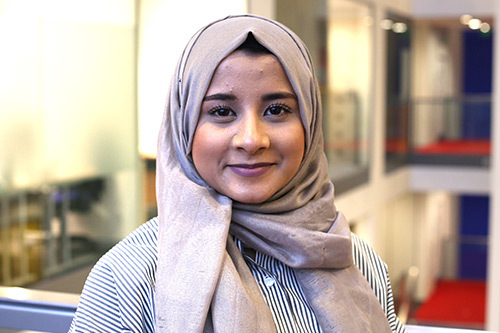 City’s Radiotherapy graduate Nazihah encourages applicants to choose a course they're passionate about to really enjoy learning. I knew City University as being a multicultural society, where people from diverse backgrounds and cultures studied. This was the main thing that attracted me to apply to City. Secondly, I researched about City and its ranking and recognised how excellent the student satisfaction rates were and the likelihood of getting employed after graduating. Understanding how other students felt being a part of City was an extremely important aspect for me as it was somewhere I would be spending 3 years of my education at so, I wanted to actually be happy and satisfied with everything there. So this motivated me further in applying to this university. As I got through via clearing, I was unable to attend Open Days and Applicant Days earlier on so I did not receive the chance of communicating with current students. However, the Open day for clearing students was very significant and useful as I was able to ask questions regarding the course and ask specific questions to the lecturers building my understanding from their point of view. Secondly, reading the prospectus was an important resource for me too; so understanding what the course involved, how many weeks of clinical placement and academic time it involved and the modules that would be taught. Looking at what modules would be taught was of great assistance as this enabled me to understand if this was the right course for me and if I would actually enjoy learning about it. My favourite thing about studying at City is the lecturers. They were extremely helpful: always giving relevant feedback when necessary and, responding to emails whenever you have any queries. In order to ensure we learn in the best possible way, they have continuously planned well-taught lectures, provided extra tutorials whenever needed and allowed us to make use of all the facilities. I was involved in the Islamic Society (ISOC) and was also a Marketing Ambassador, assisting in HE fairs, Open Days, and Selection Days for my course. How much time did you spend on placement as part of your course? In my first year, I had 6 weeks of placement at the Royal Free hospital. In 2nd year, I had 25 weeks of clinical placement, rotating through Royal Free, University College London Hospital and St Guys Private Hospital. In my final year, there were also another 21 weeks of placement involved. My top tip for all applicants would be to choose a course you would actually enjoy learning about and not just because the career involves high wages. It is important that as you will be spending 3-4 years studying this course, you have a passion for it and are genuinely interested to learn about it. Look thoroughly into the course, gain a good understanding of what the course involves and compare it to your skills and interests and figure out if this course is actually for you and something you want to do.